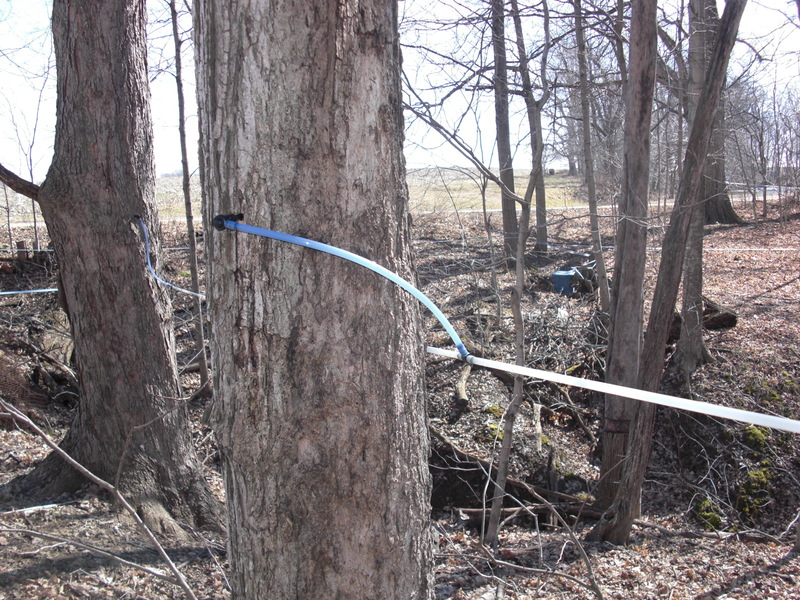 Since my beloved readers seem to like pictures, a few more from my perfect maple sugar outing. 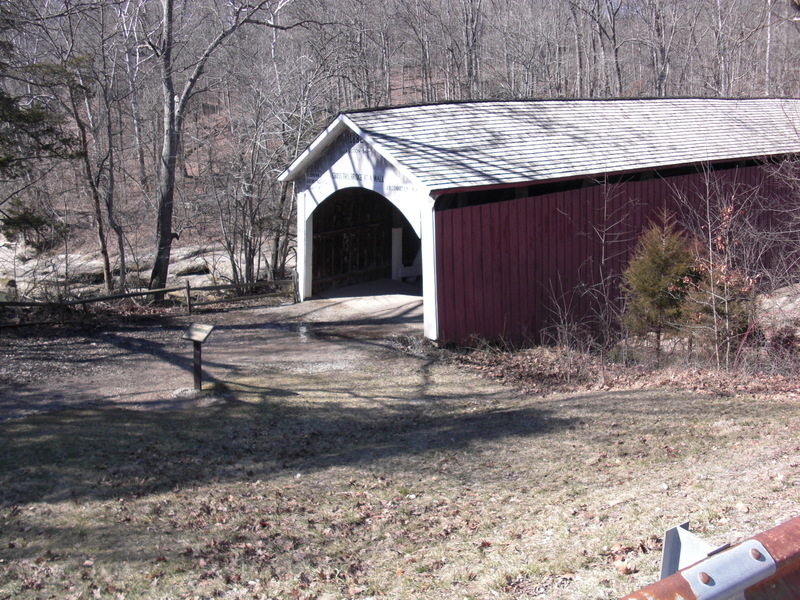 As a bonus, we drove by THREE covered bridges, one of which led us to some beautiful trails in Turkey Run State Park, where Nicki and I strolled for a while with her sweet dog, Henry. I bought maple syrup cookbooks, a maple syrup coloring book (Cheryl, if you are reading this, forget you read this as otherwise you won't be surprised by one of your Christmas presents this year! ), maple sugar candy (natch! ); also some strongly (but not maple) scented hand-made soap (at the fairgrounds there was a building selling all kinds of crafts, not necessarily maple-themed). I also bought a dog-pull toy for Henry, to thank him for being so patient during the times we made him wait in the car. As we drove home, we stopped in the town of Rockville (Parke County's county seat), and I bought some tights at the variety store on the courthouse square. But I resisted temptation and didn't buy the maple-icing-filled maple-leaf-shaped cookies I bought once before at that same store. After all, I don't want to overdo the maple sugar theme, now, do I? Discouraged but undefeated, Nicki and I drove north from the first, disappointing sugar camp to the next one on our festival list: the Foxworthy Sugar Camp. 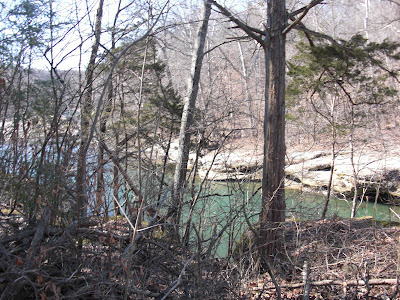 We drove through woods to get there: a good sign! 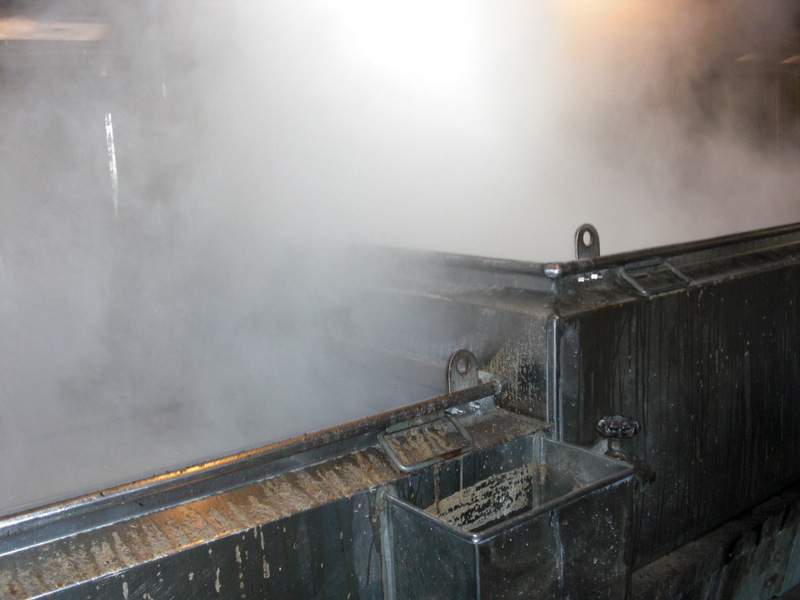 When we pulled into the camp, we saw a cloud of steam arising from one of the outbuildings: another good sign! When we inquired at the little shop if any of the trees were being tapped today, we were told, "You just walked past two of them." And we had! It was all perfect, EXACTLY the way Miracles on Maple Hill had led me to think it would be. 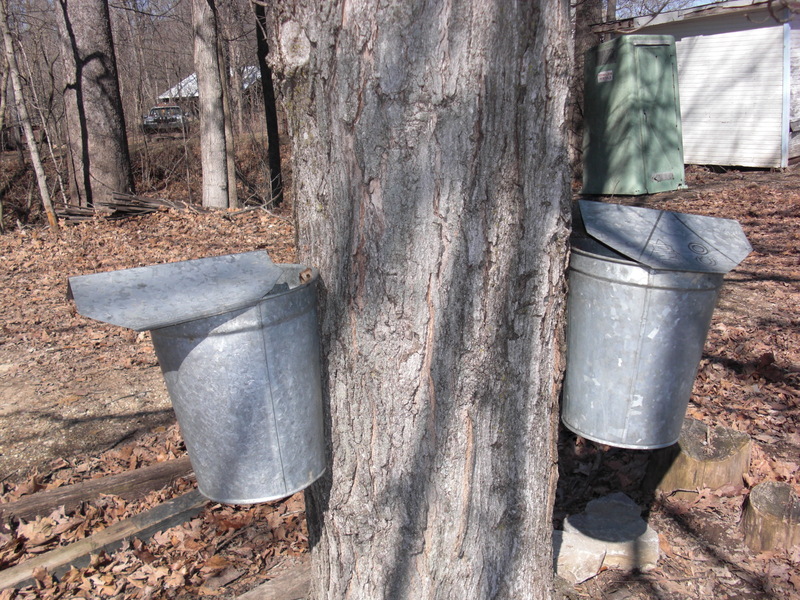 Pails hung from trees, with sap dripping into them with agonizing slowness: drop by drop by drop. In the sweet-smelling steamy outbuilding where the sap was being boiled down into syrup, we were told that it takes SEVENTY GALLONS of sap dripped into the buckets drop by drop to make ONE GALLON of syrup. If there was ever a metaphor for my faith that little things add up - an hour a day of writing, a page a day of writing - here it was. Every time for the rest of my life that I pour real maple syrup onto a piece of French toast, I will think about today: syrup as a distillation of tiny drops of sap accumulated into a vat filled with seventy gallons of sap to be boiled down into one gallon of syrup. A miracle, indeed. 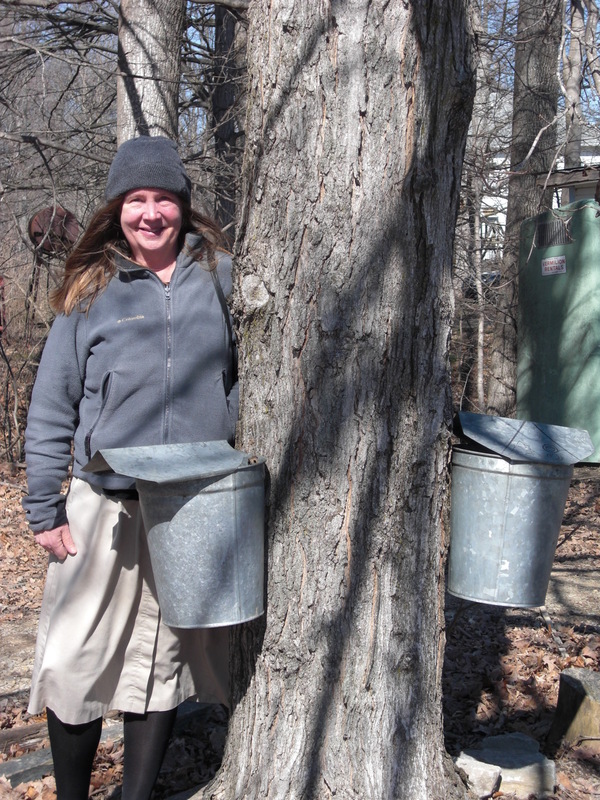 Yesterday I set out mid-morning with my friend Nicki to attend the Parke County Maple Sugar Festival. After a drive of half an hour or so past barren but beautiful corn fields and soy fields awaiting the spring planting, we reached the 4-H Fairgrounds just north of Rockville around 10:30. Although he was looking very spiffy in his little coat, Nicki's dog, Henry, had to wait for us in the car as we entered the festival headquarters where the all-day pancake breakfast was being served. For six dollars a plate, we each devoured sausage patties and a stack of fresh-flipped pancakes, with butter and, of course, extremely delicious maple syrup. Then we took the printed list of the nearby sugar camps; of the five camps on the list, only three were open today. So we drove to the first one, following various twists and turns, until we turned onto the pleasingly named Egg Farm Road. Someday I would like to live on a road called Egg Farm Road. But the camp on Egg Farm Road was not what I dreamed it would be. 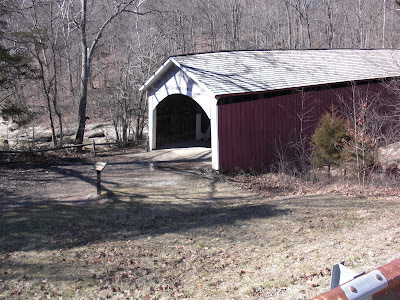 The garage-like structure that held the syrup-boiling equipment was cold and quiet; the camp was open, but they weren't boiling any syrup today. 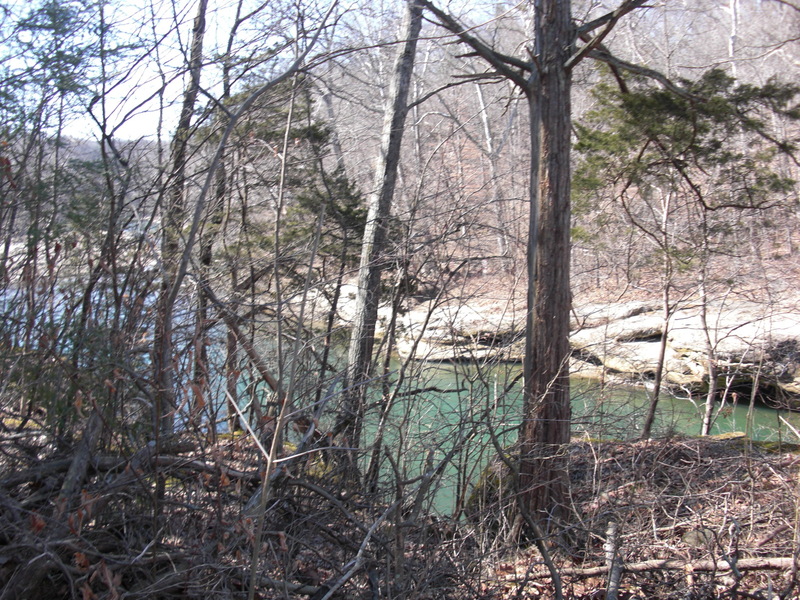 We walked over to the few sparse trees fringing the graveled area where we had parked. 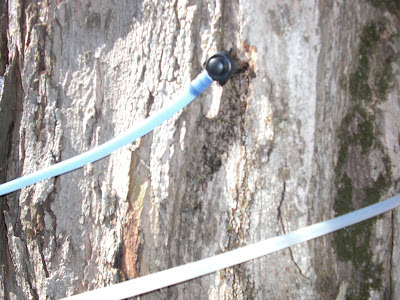 The trees had some kind of plastic tubing attached to them to get the sap out. We didn't see any sap running through the tubing, and tubing wasn't what we had come to see. We had come to see little tin buckets hanging from the trees! 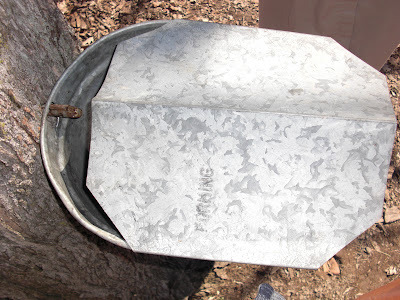 We had come to see the sap boiled into syrup! If there had been snow on the ground, I would have wanted to pour some syrup onto the snow to harden as Laura and Mary do in one of the Little House books. But there was no snow and no syrup. I thought about how my sister had almost flown out from New Jersey to go the Maple Syrup Festival with me. Was this what she would have seen: plastic tubing stuck into a couple of trees? Were there no longer any Maple Hill miracles to be had? When I was a child, my sister and I both loved Virginia Sorenson's children's novel Miracles on Maple Hill, which won the Newbery Medal in 1957. In the book, ten-year-old Marly's father is a newly released prisoner of war suffering from what we today would call post-traumatic stress disorder. Desperate for a change, the family temporarily relocates from Pittsburgh to rural Pennsylvania, during sugaring-off season. For Marly, the rising sap is a "miracle," and no more miraculous is the change it brings to her father: "Daddy is better at Maple Hill." My children's literature professor, Anne Scott MacLeod, called Miracles on Maple Hill "a very sappy book" (pun intended). But this was one of the only times I knew her to be wrong. It wasn't a sappy book, it was a wonderful book. Until I reread the book this past year as part of my research for a paper I was writing on "redemption through the rural" in mid-twentieth-century children's literature, I had forgotten the farm was in Pennsylvania, just assuming that it was in New England: didn't all maple syrup come from Vermont? But now that I am living in rural Indiana, I have discovered that not only does maple syrup come from Vermont, and Pennsylvania, it comes from Indiana. 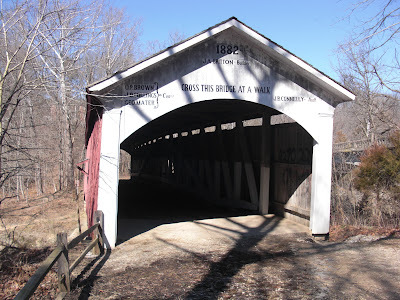 Parke County, just to the west of where I live in Putnam County, is not only the covered bridge capital of the United States, but has several maple sugar camps as well. And this weekend is the Parke County Maple Syrup festival. I was bound and determined to go the festival of course, in search of an experience I've been dreaming of for at least forty-five years now. Would it turn out to be the miracle I hoped it it would be? Today I went with my colleague Martha, who teaches the children's literature course in our English department here at DePauw, to the Indianapolis Youth Literature conference at the main branch of the public library in downtown Indianapolis. I wasn't speaking, just listening and learning. The library itself is STUNNING: a gorgeous historic structure gorgeously expanded, so that it has BOTH wood-paneled reading rooms with leather chairs in front of a lit fireplace AND soaring four-story atrium with light and air everywhere. The program featured inspirational Phillip Hoose, author of the much acclaimed book about teenaged civil rights protester Claudette Colvin (Claudette Colvin: Twice Toward Justice - she refused to give up her seat on a Montgomery, Alabama, bus well before Rosa Parks and was the inspiration for Rosa's later act of rebellion); delightful Shannon Hale (The Princess Academy and other fairy tale-based fantasy fiction); and Nick Bruel (author/illustrator of the Bad Kitty books). Sobering thought, that! But days spending time with fellow authors and committed librarians add up to years well spent. Like many people, I'm subject to envy. But one strange feature of my envy is that typically I envy not people who have achievements forever unattainable to me, people who are impossibly smarter, richer, nicer, more talented, better looking. I envy people who have things that are well within my reach, that I could have only by willing harder to get those things. Take my friend Kim. I envy the little meals she makes for herself every day. She'll email me about them, as part of our regular catching up with each other about the events of our lives. I'll hear that last night she made herself stuffed shells filled with spinach and ricotta, and a salad of fresh greens tossed with a light dressing; with that she had a glass of Italian wine from Tuscany; while she ate she listened to Vivaldi. And I'll feel this keen stab of unbearable yearning: how I want that little meal, made so lovingly by her for her, rather than, say, the piece of leftover cold pizza eaten standing up in the kitchen. And then I want to say to myself "Um, Claudia? You COULD have that." But for some reason I don't do it. Lately I've been especially envying my former self - not my much younger, thinner self of decades ago, but my self of last year. Last year at this time I was in the middle of writing a novel and I was absolutely consumed with it. I attended the convention of the Association for Practical and Professional Ethics in Cincinnati (which I'll be attending again weekend after this one), and I spent most of my time there in my hotel room writing, or sipping pomegranate martinis in the bar while writing - writing, writing, writing! This year, I'm not in the middle of writing anything. So I'll just go to the conference sessions, I guess. Poor me! Lucky her! And then I want to say to myself, "Um, Claudia? You could BE her!" But for some reason lately I haven't been writing. So: nice little meals for one. Writing something, anything. It's a topic for another day why we so often don't let ourselves have the things we want, things that seem so clearly to be within our reach. At least here in Greencastle, I do often take myself out for nice little meals to restaurants: to get a baked sweet potato and veg o'day at Chief's, to have my beloved French toast at the Blue Door Cafe. And I HAVE been making lots of tantalizing notes in the little leather-bound notebook that Gregory gave me for Christmas, which I've christened my creativity notebook. So I'm getting that much closer to eating Kim's meals and writing the way I did last year, to getting for myself those little highly attainable things that I keep on coveting. My friend Jen told me that the crocuses are beginning to pop up; she reported that one lawn on the street leading over to the darling little campus observatory is a riot of crocuses in bloom. So this morning, early, I set out to investigate. Instead of walking my usual route up and down Seminary Street, from my shabby end to the university president's grand end, I zigzagged on a different route over toward the observatory. When I got to the crocus street, at first I didn't see any crocuses at all. I knew they couldn't have died and disappeared already. I thought maybe they were asleep for the night and hadn't yet awakened to the sunrise. But surely there would be some sign of them, somewhere, even if their petals were folded tight and not yet reopened to the sun. Then, there they were! Masses of them, all tiny, all purple, covering an entire lawn. They were definitely still getting used to its being morning, but it was lovely to start my day as they started theirs. It's really been a mild winter here in Greencastle: one snow of a couple of inches, one freezing rain that left my car encased in ice that melted by the next day, a couple of cold patches where I was grateful for the big puffy coat I bought for six dollars at the local Goodwill. Nothing more than that. So I'm not sure that we really deserve spring yet. But I'll take it anyway. I give inspirational talks to writing conferences all the time. I'm good at inspiration. One of my talks is called "Defeating Your Demons." In my advertisement for the talk I promise to silence all those terrible voices inside writers' heads, those voices that say that it's impossible to get published, that kids today don't read, that everything has already been said before. After hearing my rousing speech, writers in the audience are supposed to dash away, reinvigorated and restored, to WRITE! It is time for me to give this talk to myself. I've just had a major, devastating rejection on a project that I've been working on for the past six months, a project that was VERY close to acceptance, or at least I thought that it was. And then: no go. This is on the heels of a rejection I received for another project, also the fruit of much toil, last fall. Oh, and this most recent book series was rejected for being "old fashioned" - just what an author at my stage in her career most doesn't want to hear, especially after she thought this idea was PARTICULARLY cutting edge. You are over the hill. Even if you think of new ideas, they, too, will be old fashioned. You don't even want to write books that are "edgy" or whatever the opposite is of old-fashioned. There are thousands of books being published every year. Who needs yours? Why is it so much easier to silence other people's demons than to silence my own? Okay, sister, time for the Claudiaized version of the talk. Your career is not over. In fact, the editors who rejected your work at both houses took pains to say that they want to work with you again, and SOON - just on a different project from the ones you've been working on. But still. Besides, let's face it, those "six months" of work on this most recent project really was just a matter of weeks, if you eliminate all the non-writing time, and complaining time, and sheer idleness in between each writing stint. You are not washed up and over the hill. Your books get good reviews. They receive some (modest) end-of-year distinctions. 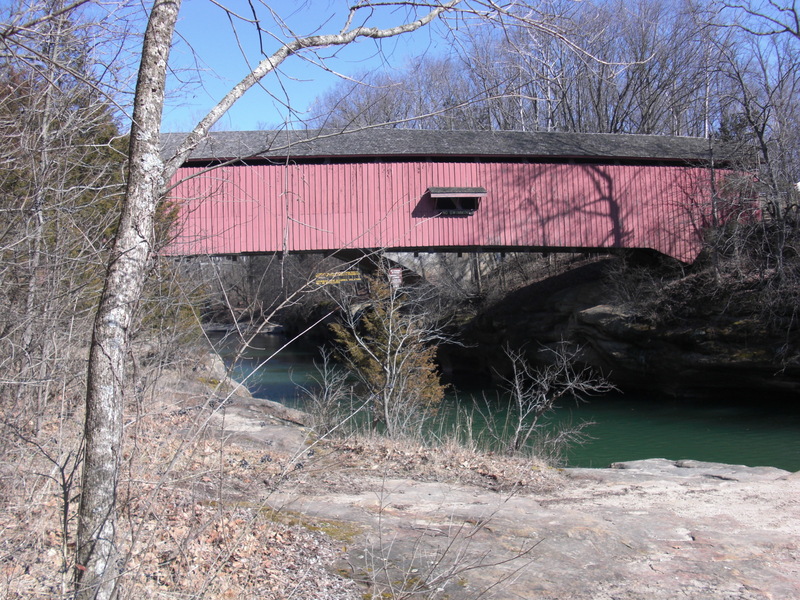 You get invited to cool places (like Warrensburg, Missouri, coolest of all!) to talk about them. Old-fashioned books still win the hearts of readers, if they are done well enough. Just make your next old-fashioned book irresistible. That's not so hard to do! There are thousands of books being published each year, so why NOT yours? Besides, Miss Claudia, none of that is really to the point. What is the point? The point, my dear, is that you love to write. You are only happy when you are writing, particularly when you are writing in the early morning with a mug of hot chocolate beside you. Particularly when you are past the midpoint of a book. But you can't get to the middle without writing the first half. And you can't write the first half without writing the first page. And you can't write the first page without writing the first sentence. All right. Turn off your computer. Get dressed. Walk to the Blue Door Cafe. Order hot chocolate. Drink it. Start writing. Go! Go! Go! Today I met with a mentorship program on campus that brings elementary school students from nearby Cloverdale to spend the afternoon with college student mentors: little buddies and big buddies. One of the most motivated and wonderful students from my winter term class on children's book writing is an organizer of the program, and so I came at her invitation. Although I speak regularly at elementary schools, I have to confess that I was surprised at how unused I am to being around so many kids in such an unstructured setting, without the constraints provided by school authorities. These kids had so much energy! So MUCH energy!!! Nadiyah asked me to talk to them for about ten minutes - which was plenty! - and then open the floor for questions, which I did. The fun part came as they settled down - well, sort of settled down - to write and illustrate their own books. I circulated around the room, admiring their efforts. Some had long, complex stories dictated to their mentor/helper; some wrote the stories themselves and read them to me (a good thing, as I could never have guessed how what was written on the page corresponded to what was being read aloud). One child decided to call her story "The Digging Dog" - great title! Then she asked me: "What should the first word be?" The question caught me off guard. I spend a lot of time thinking, as all writers do, about what the first line or sentence of a story should be. I had never before thought about what the first WORD should be. She settled finally on "Once." That is certainly a time-honored first word! I had to leave before she decided on the second word. No one ever said that writing was easy. We writers have to come up with word after word after word after word. I don't know if I helped these little buddy writers today to make it any easier. But it was fun to watch one young writer giving every word so much thought and loving care. I was already having a very pleasant Valentine's Day. Unexpected flowers arrived from a friend, delivered to my Prindle Institute office, to congratulate me on making the Chicago Public Library best-of-the-best children's book list for 2011, and there is nothing like the squealing fun of having flowers appear on the morning of February 14th. I enjoyed reading everybody's Valentine posts on Facebook. Email brought the announcement of the birth of a dear friend's baby, so now she has two little boys. Class went well. Then, as I was leaving class, I was accosted by a faculty member who works at the DePauw Writing Center; she was standing outside the center door to invite everyone in for their Valentine's Day open house. Of course I accepted the invitation, only to behold a table covered with adorable little pink cupcakes, miniature brownies, and a CHOCOLATE FOUNTAIN, surrounded by plates of dippable objects: strawberries, pink and white marshmallows, bite-sized chunks of angel food cake. Not only did I dip away merrily myself, I became the chief recruiting officer for the chocolate fountain. I ran down to the political science office and brought Deepa and Krista back with me. I ran up to the philosophy department office to share the news with colleagues there. I bumped into Lili from creative writing on the stairs: did she want to come see the chocolate fountain? Indeed, she did. I think I made four visits to it all in all. The day finished up with session two of my Cheshire Calhoun reading group, this time discussing her essay, "The Virtue of Civility." I supplemented the usual wine and cheese and other munchies with a heart-shaped box of Russell Stover chocolates and a bowl of those little conversation hearts (which I can't stop eating). No chocolate fountain, but maybe four trips to the chocolate fountain were enough for one very happy Valentine's Day. Acclaimed author Ian Frazier - New Yorker writer for decades and author of many books including Great Plains, On the Rez, and his memoir Family - is here at DePauw for two weeks as a visiting distinguished professor of creative writing and writer-in-residence. Last night I organized an event out at the Prindle Institute as part of our year-long series of events built around the theme of "the ethics of life writing." For an hour, Ian sat with me and my colleague from creative writing Peter Graham by the Prindle fireplace to field questions about the ethical challenges involved in writing about one's own family. He said that his family had saved so much memorabilia from their lives together - everything from huge quantities of letters to old pieces of farm equipment - that he had the sense that they wanted, or at least expected, that he would do something with it. He said that he writes only about what he loves, and that when you're writing from love, that love is going to illuminate what you write and usually ends up making others feel glad that their lives were recorded in that way. He said that the high school girlfriend whom he wrote about in one chapter had her lawyer (!) ensure that she read not only the parts about her, but the whole entire book, before giving it her blessing. He said that a writer has to balance the importance of some episode or observation to the book as a whole against the possible pain it might cause to those depicted in it. He said that he wrote about his recently deceased parents with the goal of restoring to them what they had lost in their late-life decline, and to give their lives meaning. It was a wonderful hour of discussion - he's not only wise, but hilariously funny - and well attended, too (perhaps 65 people in the audience, from the community as well as from the campus). The little sandwiches I ordered from Treasures on the Square were very tasty. The predicted snow didn't materialize until people were safely home. Altogether, a most successful evening! I have been stuck in my writing of late, withering from want of encouragement from the great world beyond, wishing I would get more reviews of my Mason Dixon series, wishing I would get some end-of-year distinction for the THREE books I had published last year, wishing I would get an invitation to somewhere alluring, wishing I would hear from a certain editor about a certain project. Then last night, while I was wasting time on Facebook, I saw that the Children's Book Guild of Washington, D.C., had posted a link to the Chicago Public Library's recently issued list of the "Best of the Best" children's books of 2011, because two Guild members were on the list. I am a member of that organization, even though I haven't lived in the D.C. area for over two decades now. So I clicked on it to see the names of my two Guild member friends, and when I did, I had the nice surprise of seeing my own Fractions = Trouble! as one of the featured titles (easily overlooked by the Facebook poster, as nonresident members can be out of sight and out of mind). Good news at last! I posted my own little Facebook brag; as of this writing some 72 Facebook friends have "liked" my post. Yay, I thought! I got my little fix of fame! I got my little whispered word of encouragement from the universe! Now I was ready to write! Alas, all I've done today is surf the Internet to see if I can find MORE little fixes of fame, MORE whispered words of encouragement. Like an alcoholic who has that one fatal swig of hooch, I've reawakened a ferocious thirst. I need to stop this. I need to write something for its own sake, for the sheer joy of putting words on paper. I need to do this because I am a writer, and writers write. If I can't write a chapter, I can write a page. I can write a poem. I can make notes in my creativity journal. I can write this blog! (I can always write this blog!). No more self-Googling! I'm going to stick my fingers in my ears, and if the universe has anything else to whisper to me, it will have to wait until I'm ready to give it my attention, because as of this minute, I am going to be too busy writing even to notice. It turned bitter cold here this weekend. I took advantage of the weather to spend my entire day yesterday doing what I might love best in the world - even more than writing? - well, almost as much as writing: reading. I forced myself out of my nice warm bed in the morning and headed over to the Blue Door Cafe. I sat there for two hours, over hot chocolate and "breakfast casserole," reading Cheshire Calhoun's paper, "The Virtue of Civility," for our reading group on Tuesday night, as well as getting through ten more ten-paged submissions for the Undergraduate Ethics Symposium - papers on topics such as the dearth of legal services for the indigent in New York City, arguments against penalizing "poor lifestyle choice" in the context of health care provision, benefits to Muslim women of wearing hijab, and removal of exotic species from public lands. Home again, I got back into my nice warm bed and stayed there for the next seven hours. I read all of Nick Hornby's hilarious/disturbing novel, How to Be Good. I read three (short) children's books I'm going to be reviewing. I read the first four essays in Edwidge Danticat's collection, Create Dangerously: The Immigrant Artist at Work. In The Writing Life, Annie Dillard says, "Who would call a day spent reading a good day? But a life spent reading -- that is a good life.” She's right about her second point: a life spent reading is a good life. But she's wrong about her first point. Who would call a day spent reading a good day? I would! Yesterday I wrote about the knot that I have in the pit of my stomach on the days that I have to teach. Today I want to record the flip side of that: the exhilaration that comes when teaching goes well. My class yesterday went very well, in my own humble opinion. I have never before taught a class with such a diverse population of students, including a woman from Ghana, a woman from South Korea, a woman from Tokyo, an African-American woman, a Latina woman, as well as students from different disciplines (philosophy, biology, politics, science, women's studies). And even, in this class on Feminism and the Family, one male. On Tuesday we had gone around the room and generated our own definitions of the family, ranging from "a group of people who live together related by blood or legal ties" to "a group of people joined together by commitment and love." We did this in the context of discussing an essay by Linda Nicholson on what she calls the myth of the "traditional family." Yesterday we talked about what families are "for" - what purposes do they serve for their members and for the wider political community? - as a way of engaging the debate between political theorists William Galston and Iris Marion Young about the degree to which certain family forms (e.g., the "intact" two-parent family) achieve these purposes better than alternative arrangements. Lots of people talked. The time flew by (at least for me - but believe me, if it drags for me, it drags even more for my students). I was happy about the class for the rest of the afternoon. It's strange how I dread Tuesdays and Thursdays, when I teach, and look forward to MWF, which offer me wide open meadowlike spaces to write, read, work, cross all kinds of other tasks off my list, and yet I'm almost always ecstatic on Tuesdays and Thursdays, from having class go well, whereas I often sit paralyzed on MWF: I have so much that I should be doing, but nothing that absolutely has to be done TODAY, that I sit at my desk unable to make myself do anything. Anything except for my blog, of course! I don't know what to conclude from this. Maybe that structure is good, that real deadlines (like having to walk in the door of Asbury 112 at 12:40 and teach that class) are motivating. I need to try to trick myself into imposing more restrictions on my non-teaching days. I do find that I get more done on those days if rather than facing my hundred-item to-do list, I tell myself: just do this ONE SMALL THING, but ACTUALLY DO IT. So now I need to come up with my one small thing for today. It should either be: 1) start reading the 68 10-page submissions that I have to assess between now and February 20 for our Undergraduate Ethics Symposium - read at least ten of them today, or maybe at least five, or maybe just make myself open the zip file and read at least ONE: or 2) spend at least one hour on the paper I'm supposed to be contributing to a volume called Philosophy in Schools: An Introduction for Philosophers and Teachers - my chapter is supposed to be on "philosophical children's literature for middle school." For some reason I'm stuck on this, maybe because I just wrote something similar for a volume called Philosophy and Education: Introducing Philosophy to Young People and so I have to find a way not to repeat myself. Either one of those tasks would do. The one that is stressing me most right now is the book chapter, so I should do just ONE HOUR on that. Or even half an hour. Or even fifteen minutes. And then dread will turn into delight. And the rest of my life will be happy forever. That's how I feel on Tuesdays and Thursdays after my class. That's how I want to feel today. I have been teaching philosophy at the university level for twenty years now. I love teaching, and I've had some lovely recognition as a teacher, including a university-wide teaching award two or three years ago. So you might think I'd be confident as a teacher, that I'd leap out of bed and skip over to my classroom with a light heart on each teaching day. You would be wrong. Even after two decades of teaching, I always wake up on teaching days with a sick feeling in my stomach. It feels impossible ever to be prepared for teaching, because the classroom experience has so much in common with improv theater: even in a large class, it isn't just a lecture, or a performance; there is always interaction with an audience, and with an unpredictable audience, one that can ask ANYTHING or say ANYTHING, and then it's up to the teacher - that is to say, to ME - to incorporate that into the shape of the hour somehow. And what if the audience says NOTHING? What if I call out, "Give me the name of a town! Now give me a career - policeman, fireman? Now give me a common household object!" - and nobody says anything? If they just sit there in stony silence and I have to create the whole improv routine out of nothing at all? It doesn't help that for some terrible reason I don't seem able to prepare for class until the day of the class itself. As soon as I do prepare, I start to feel better: surely they will have lots to say about THIS! But I don't seem able to do this the day before. And I always feel better once I actually teach the first class of the day, vastly better: oh, I DO remember how to teach, I do, I do! But this semester, I'm not teaching until the afternoon: my class is from 12:40-2:10 (note: an hour and a half is a LOT of time to fill). So I have all morning to fret and fidget, which is what I'm doing right now. Okay, I'm off to prepare. My particular bunch of students this semester is wonderfully lively and engaged, so I know class today will be good. Or at least I hope it will be. But what if - no, don't think that way! Go off and actually prepare the darned thing! Go! I used to have the life strategy of planning out five episodes of happiness for myself each day. The episodes could be small. Small ones are often the best. But they had to be reliable/guaranteed episodes of happiness. For example, sometimes teaching my class is the highlight of my day; other times, I leave class feeling that I have to wear a bag over my head for the rest of my life. So I never put "teaching my class" on the happiness schedule; if it ends up being an episode of happiness, that's a lucky extra in my day. Favorite items included: 1) lingering in bed for an extra ten minutes in the morning, without guilt, luxuriating under the covers; 2) walking a few extra blocks before I got on the Skip to go work; 3) having lunch with a friend; 4) reading a good book for half an hour before going to bed; and 5) ??? It was always fun to try to come up with that fifth episode. Since I've come to Indiana, I've fallen out of this habit. Every day here is one long unbroken stretch of happiness. But lately I've decided that I missed the practice of distinguishing and honoring distinct little bits of happiness. So sometimes now I reckon up my episodes of happiness after the fact. 4) my class - really good! 5) session one of my Cheshire Calhoun reading group, all of us sitting by the Prindle Institute fireplace discussing Cheshire's essay, "Changing One's Heart" - extremely fun! That makes six, not five. But there is nothing wrong with having an additional episode of happiness, or for that matter, two or three or four. For those of you interested in what I ate for breakfast today, today I tried out a NEW BREAKFAST PLAN. The Blue Door Cafe has beautiful hot chocolate, delicious French toast, and perfectly cooked omelets, but their oatmeal, I regret to inform you, is of the instant variety that comes in those little packages; they just don't have enough early morning traffic to justify having a big pot of oatmeal sitting on top of the stove. So today I took an early morning walk up Seminary Street (my street) from the un-fancy end where I live to the very fancy end where the president of the university lives; then I walked back on Anderson Street, where I may live next year (I've looked at a beautiful century-old house there that would be available when its owner departs for her sabbatical year in Germany). I ended up at the Hub (student cafeteria/food court) in the student union on campus, where they offer have a big pot of oatmeal, as well as a big pot of cream of wheat. I fixed my bowl by layering it: first a bunch of oatmeal, then a layer of brown sugar and raisins; then repeat. The final effect was like eating a bowl of molten oatmeal raisin cookies. Cost: $1.70. I still love the Blue Door beyond all reckoning, but this made a nice change on a gray morning. It's good to expand one's culinary horizons, don't you think? Yesterday I heard FOURTEEN different talks in the Grimm Legacy Fairy Tale Symposium at Harvard. I sat on a comfy couch in the back of the ornate room at the Barker Humanities Center, choosing coziness over a clearer sight line to the podium. Sitting on the couch with me were a children's librarian from Rhode Island and a professor of Portuguese at Harvard who remembers all the fairy tales told her by her grandmother as she was growing up in the Azores Islands. Maria Tatar, brilliant scholar who chairs the Program in Folklore and Mythology at Harvard, gave exquisite opening remarks. I tried to write down all her best sentences, such as this one: "Stories make the human world, and they also make the world human." She talked about Gretel as a trickster heroine who spawned a legacy of surprisingly strong girls, such as Pippi Longstocking. She quoted James Baldwin: stories are "the only light we've got in the darkness." David Rice, recent Harvard graduate who is just back from a year in Berlin working on his novel (now I want to have a year in Berlin working on MY novel! ), spoke eloquently of the distinction between the "forest" - a literal, real place that can be mapped - and the "woods" - the landscape of imagination, a subjective state of feelings. He distinguished fairy tales, where readers sign an implicit contract to enter a world of magic, and literature of the fantastic, where magic breaks in unbidden. Ariane Mandell, completing a degree at Harvard Divinity School as she also completes her first novel, talked about the role of tears in the Grimm stories, first invoking ancient Jewish wisdom that tears have the power to get God's attention when nothing else will. The miller's daughter's tears bring the aid of Rumplestiltskin; then her tears get him to grant her a reprieve on her promise to give him her firstborn child. Cinderella waters the tree over her mother's grave with her tears, thus bringing her the magical assistance she needs to go to the ball. To weep is to hope, Ariane said; people with serious enough clinical depression no longer bother to weep. Perri Klass, pediatrician and author of numerous essays on literature, distilled a century of childrearing advice from leading physicians on whether or not parents should read fairy tales to children. Dr. Spock said no: the world has enough cruelty in it without gratuitously introducing more. But he is in the minority. Bruno Bettelheim said that when children request the same story over and over again it is because there is some message that they want the PARENT to get! Animator Ruth Lingford showed her hauntingly beautiful film of the lesser-known Grimm tale, "Death and the Mother." Jerry Griswold brought the house down with hilarious musings about the different endings of "Beauty and the Beast," focusing on Beauty's bewilderment when her beast is suddenly replaced by some handsome stranger: "Who the heck is THAT?" John Cech looked at Sendak's illustrations of Grimm; Michael Patrick Hearn looked at the Cruikshank illustrations from the first English-language edition of the tales. Claudia Schabe showed clips from socialist retellings of the tales in East German films of the Cold War era. And more! I was too tired to go out to explore Cambridge in the evening. I waltzed back to my bed-and-breakfast and got in bed and read. I now have a couple of hours before I have to head to Logan for my flight home. Should I walk around Cambridge in this sunny but very cold morning? Or stay curled up at this sweet Irving Street b&b? Or maybe a little bit of both? I've been trying to remember the last time I was in Boston or Cambridge; I think it might be at least twenty years ago. We came here once as a family when Christopher was a toddler, before Gregory was even born. I know I came here for the APA (American Philosophical Association) convention the year I went on the job market. Those are the only two times I can remember. But once upon a time, when I was an undergraduate at Wellesley, taking a good number of classes at MIT through the Wellesley/MIT exchange program, I rode the bus into Cambridge several times a week for a period of years. Now I'm back for a blissful weekend attending the symposium Harvard has organized to celebrate the 200th anniversary of the publication of the Grimm Brothers' fairy tales. I flew in this morning and got from Logan Airport to Harvard Square for a $2 Charlie ticket on the T (the ticket presumably named for the song "Charlie of the MTA"). I easily found the charming bed-and-breakfast on Irving Street, near the Harvard campus, where I had reserved my room for these two nights. My room is two flights up, tiny, with a shared bath: exactly what I wanted. A computer is available in the parlor; that's where I'm typing this now. Each room is stocked with books to read (which guests are welcome to take); the parlor also has magazines, including The New Yorker, and newspapers, including the New York Times. For the next couple of hours I wandered around Cambridge, spending most of my time in the aisles of the Harvard Book Store (not the university bookstore, which is the Harvard Coop). I bought three books: Anne Sexton's book of fairy tale poems, Transformations; Diderot's Rameau's Nephew; and Nancy Mitford's Voltaire in Love. At first I thought the bookstore's relatively small section of children's books boasted no Claudia Mills titles. But then I looked again: two copies of the newly released paperback for Being Teddy Roosevelt - hooray! I asked the guy at the bookstore for a lunch recommendation and he directed me to a place called Darwin's on Mt. Auburn Street: truly excellent sandwiches, plus comfy armchairs for starting in on reading Diderot. Then it was time for the symposium to begin, in the Barker Center for the Humanities. Two talks today: a presentation on the development of the SurLaLune fairy tale website that contains thousands of versions (and classic illustrations) for dozens of fairy tales - and the keynote address by prominent fairy tale scholar Jack Zipes on the Grimm brothers' legacy in contemporary Germany. Tomorrow there will be talks all day, starting at 8:45 and going until 6:30. Right now I'm eating moist chunks of apple cake provided by the bed-and-breakfast - and then I'll curl up in my single bed and read some more, probably fairy tale poetry tonight. I'm so glad I came! In Colorado, precipitation in the winter comes in the form of snow. Any wet stuff that falls out of the sky is going to be white fluffy stuff. Not so in Indiana, where winter can bring rain, or snow, or, worst of all, freezing rain. I heard that the community of Greencastle was paralyzed for a week last winter, the university closed and classes canceled, because of an ice storm that left intractable ice covering everything. I had my first encounter with the freezing rain of Indiana a week or so ago. I left the play I had attended on campus (shamefully having driven the very short distance to get there because of the inclement weather) to find my car entirely encased in a thick covering of ice. I turned on the heater and front and rear defrosters, as I chipped away at that ice for all I was worth, but I couldn't make a single dent in it. Finally, the guy scraping and chipping at his windshield behind me came over to show me how to proceed: just get one TINY little crack in the ice anywhere, and then use that to gain purchase on the rest. I finally did clear enough of the windshield to be able to drive home. But in the process I made the mistake of trying to force my windshield wipers to do their share in the ice removal ordeal. The poor wipers couldn't do it any more than I could. The next day, one of them refused to go altogether, its heart having given out under the unfair strain. Or so I thought. But then, after a few days of rest, I tried the wipers again, and the ailing wiper made a miraculous recovery and wiped along merrily with his brother as if nothing had happened. But then, alas, when I tried the same experiment again on the following day, that wiper had a relapse and ground to a halt halfway up the windshield. His brother kept on going, the two got entangled, and the healthy wiper was now mangled: fatally injured! So it was time to take my little Chevy Aveo to York Chevrolet. Guess what I paid for the repair? $9.36, for the replacement wiper. The kindly manager tightened the originally ailing wiper and replaced the subsequently destroyed wiper for free. It all took less than ten minutes. So thank you, York Chevrolet! But next time there is an ice storm, I'm going to treat my windshield wipers with more loving kindness, that is for sure. When it comes to windshield wipers, this Colorado girl turned Indiana girl is sadder and wiser now. This is going to be a year filled with fairy tales for me. I've been working on what I hope will be a series of young chapter books that have a fairy tale theme. The children in second grade at Grimm Elementary are studying fairy tales; each child is assigned a fairy tale of his or her own, charged with retelling it in some new and different way. But as the children work on their retellings, they find that their own lives start to parallel their fairy tale in uncanny and illuminating ways. So far I've written Priscilla and the Pea, and now I'm working on Jeremy and the Beanstalk, while waiting to hear from the publishing powers-that-be if the idea is a go. I'm also writing a poem every Thursday to share with two poet friends from last year's poetry retreat, and I've decided to write fairy tale poems, as poems of doomed love are not to my taste this year. I want to write them in all different forms: sonnet, pantoum, sestina, haiku. I'm going to be teaching children's literature in the English Department here at DePauw this fall, and of course we'll cover fairy tales. So when I saw that Harvard is hosting a one-day extravaganza this weekend to celebrate the two-hundredth anniversary of the publication of the Grimm Brothers' collection of fairy tales, I thought, maybe I should go to this. And so I am. I'm flying on miles, I'm staying at a darling bed-and-breakfast right off Harvard Square, and I'll be rubbing shoulders with all the greats of the world of fairy tales, Jack Zipes, Maria Tatar, Jerry Griswold, and so many others, at the Harvard symposium for Grimm Legacies. Land of fairy tales: Here I come.